If you ask him about the term "Saxhleel", he'll respond with either "Forgive me. It's a term I haven't used in some time. While most in Tamriel call my kind Argonian, we prefer the term Saxhleel." if you are not an Argonian, or "Forgive me. It's a term I haven't used in some time. 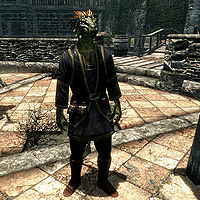 While most in Tamriel would call us Argonian, we prefer the term Saxhleel." if you are. Either way, he will continue by explaining, "Madesi was actually my original Saxhleel name. Unlike others, I decided to embrace tradition and keep it that way." Esta página foi modificada pela última vez à(s) 05h20min de 26 de janeiro de 2014.